As I’ve previously mentioned, we opened a shop in Roslindale Square exactly a year ago yesterday! 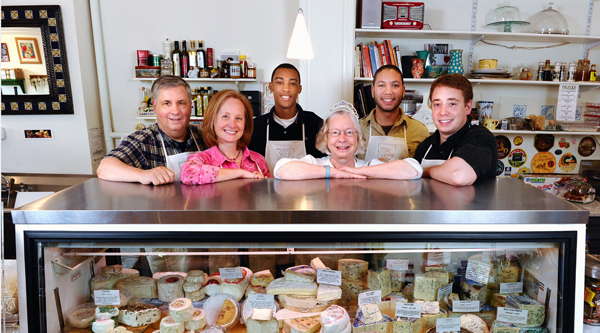 Our next door “neighbor” is The Boston Cheese Cellar, owned by husband-wife team John Pierce and Kathy Lacher. The Boston Cheese Cellar opened in December 2006 and just celebrated their 5-year anniversary this past winter. We’ve loved this cheese shop since they opened and we’re really happy that they have been successful and have continued to keep their business going in this tough economy. A clear sign that they are doing something right! The Boston Cheese Cellar offers an incredible selection of local and US cheeses, as well as an exceptional selection of European cheeses. One of our personal favorites is the variety of truffle cheese that they sell. The 7-yo loves him some truffle cheese! 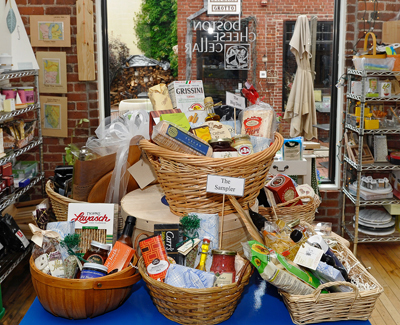 In addition to cheese, we offer an excellent assortment of crackers, chocolate, pasta, olives, olive oils and balsamic vinegars, mustards and honey (including local varieties). We stock many local products such as Johnny Cake mix, spicy chutney, fudge, coffee and tea. We sell baguettes baked fresh daily. We offer cured meats and lots of hot sauces. We have beautiful cheese boards and utensils, butter bells, honey and mustard jars, and fondue pots. We are always on the lookout for new and compelling products that complement the character of our store. A basic Ploughman’s is crusty bread, cheese plus pickled onions and chutney but this can vary considerably and it may also contain a selection of cold meats, ham, maybe a slice of pate and/or a slice of pork pie, sometimes slices of apple or other seasonal fruit. Traditionally the cheese, bread and pickles would be home-made by the ploughman’s wife – making it a cheap and substantial lunch. Today, a good Ploughman’s will be cheeses of the region and at the very least British; the same for the meats and other accompaniments. The bread must be a thick wedge of crusty bread or a baguette, anything less will not hold up when piled high with cheese, chutney and pickles. When available, the Ploughman’s Lunches at the BCC are awesome. You get a nice chunk of crusty bread (from another neighborhood staple, Fornax Bakery), two hearty slices of cheese (that changes daily), pickles, grapes or another fruit and chutney or pepper jelly. 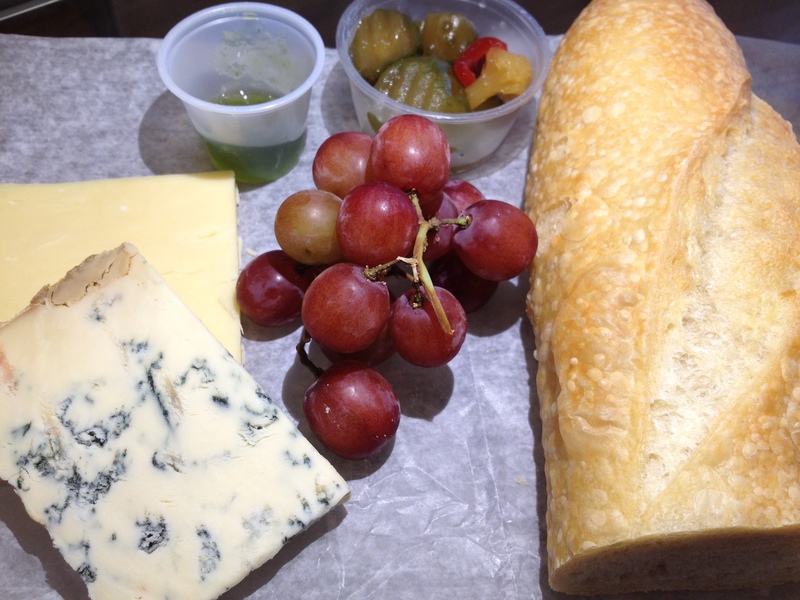 Today’s had the (sweet) pickles, a nice size slice of bread, a blue cheese, a cheddar, pepper jelly and some grapes. 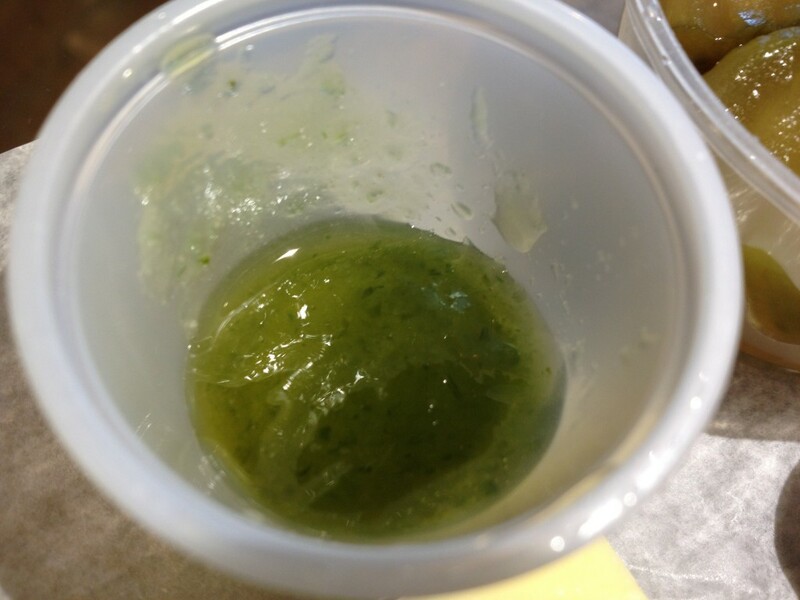 Most pepper jelly I have had is red… this one is green and I’ll have to ask Kathy why. It must just be what kind of pepper it’s made with. It doesn’t matter though… it’s great! 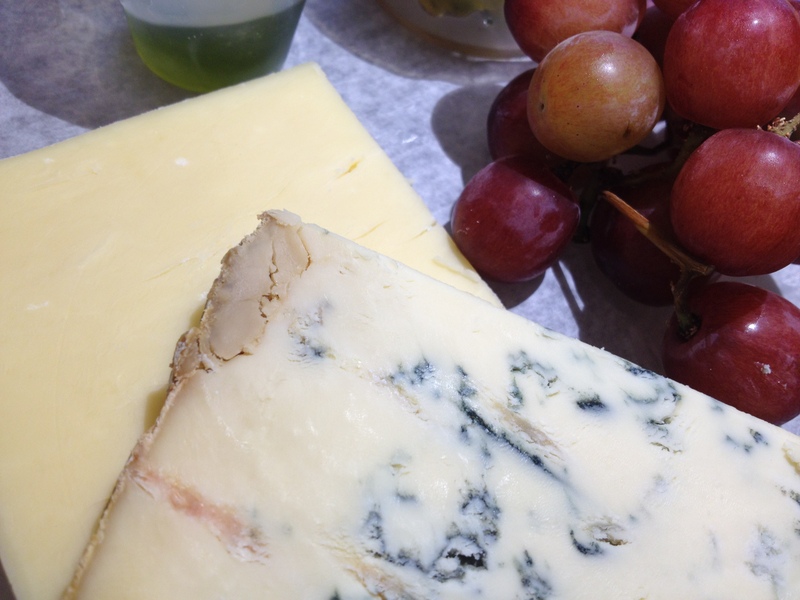 Not spicy, but with a distinct pepper flavor and sweetness that pairs well with the more pungent cheeses like blue and sharp cheddars. 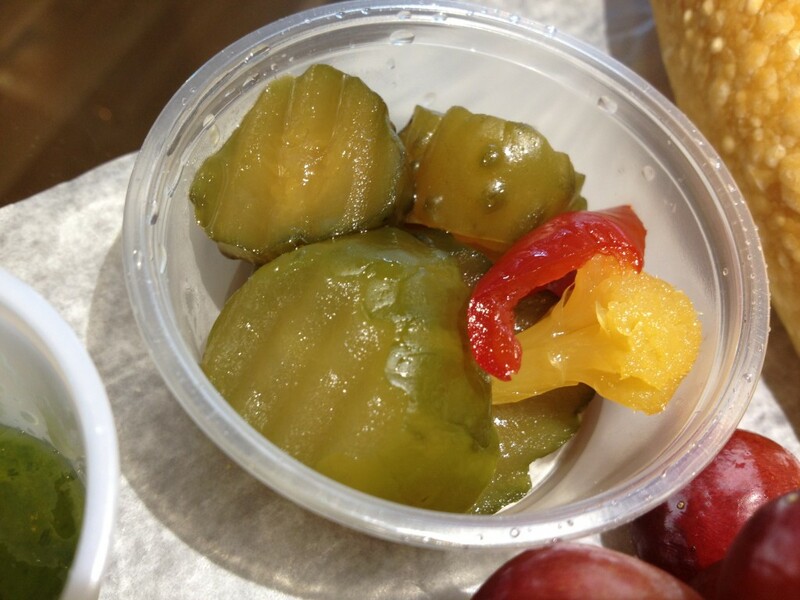 The pickles, which are sweet and VERY crisp, include a few pickled vegetables too. The chunks of cheese are very generous… my guess is about 1-2 oz each and more than enough (if eaten with everything the lunch comes with) to leave you feeling very full and satisfied after. Before we opened the shop, I never really had the opportunity to get lunch from the cheese shop… but now, I try to hit them up every once in a while to enjoy this splurge of a meal. OH… and I forgot to mention… all of this for JUST $6.95!! !